Bake with a Legend is part of the new trend of offering ‘experiences’. This particular experience offers you the chance to take a baking class from one of the previous stars of the nation’s favourite TV show, Great British Bake Off. I went down to check out a class - but can they transform me from baking beginner to cake clever-clogs? My class was with Andrew Smyth – yes, the articulate young man with the perfect bone structure and charming jumper selections – from Season 7. Though it’s impossible to speak of the other Bake Off legends, Andrew was a faultless teacher and of course is a horribly impressive baker. Whether you are a beginner or an expert, the demonstration and instruction are perfectly balanced so you never feel out of your depth, or bored. On a personal level, as a complete beginner, I was entirely surprised I was able to make the complex and skilled bakes we ended up with. The two dishes we make are centred on two different types of pastry: puff and shortcrust. The first dessert is a Christmas spiced Paris Brest, which I learn is nothing risqué but rather a delicious puffed up pastry ring with cream and raspberries. Our second bake was a delicious chocolate orange tart. Both bakes had very technical aspects and fun, artistic aspects. Everything is run smoothly by the team, made up of one Bake Off star and two Bake with a Legend helpers who make sure you have exactly what you need and that everything is going to plan – it was certainly helpful during my class for Andrew to be reminded not to forget the sugar in his pastry! Of course, questions about the behind the scenes of Bake Off abound, and we were able to get a real insight into how the programme is made – apparently, you have to notify the crew every time you were about to put something in the oven, so they could get that all important shot. Andrew of course also made sure he gave us his personal baking top tips and ‘cheats’, little ways of making your bake that much better or that much easier to do, which I couldn’t possibly reveal here. You’ll be very well looked after throughout the class, too. The four-hour session begins with a nice cuppa round the table while everyone gets introduced, there are snacks provided throughout (and you get to eat your creations, duh) and ends with a glass of prosecco or orange juice – of course, there’s also the big moment when your Bake Off star inspects the bakes and declares a star baker. 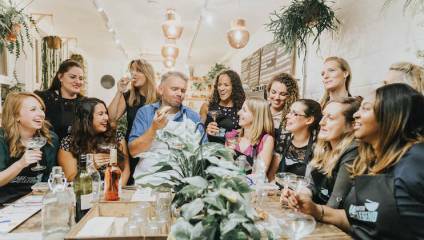 Private Bake With A Legend parties are available for birthdays, hen dos or corporate events, all of which would probably go down a treat. The vibe is just right: good, clean fun with a slight competitive edge and probably, in the case of the hen party, the opportunity to arrange your strawberries in a naughty shape or something. Finally, the company has also recently included an ‘At Home’ option, where you can welcome the GBBO stars into your own home to unleash them upon your kitchen tools. Better make sure you have enough fridge space – nobody wants a repeat of Baked Alaska-gate. The classes take place at locations throughout London and beyond. Check the Bake With A Legend website for more details.